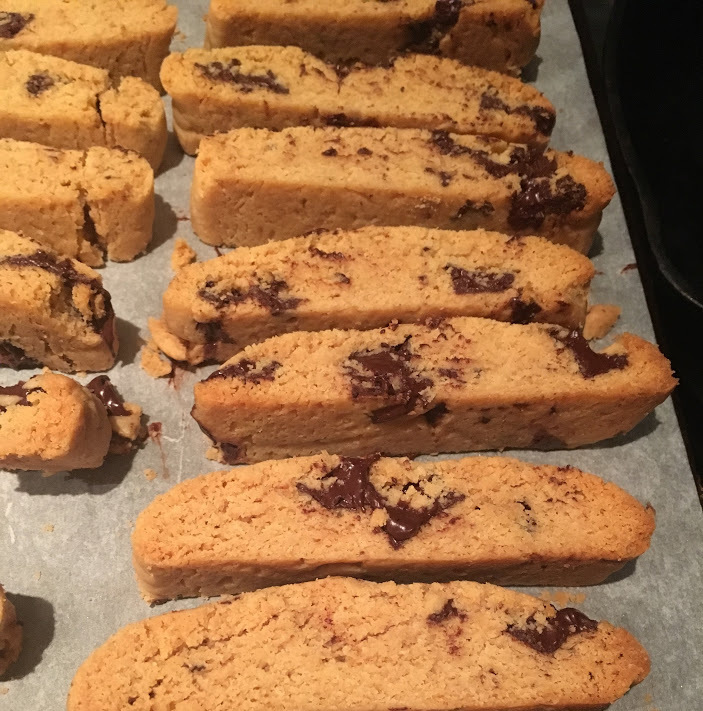 I recently wrote a column for The Knockturnal about my latest cookie creation: biscotti with a subtle peanut butter flavor and bursts of dark chocolate. With a high fat content from the peanut butter and nearly a stick of butter, these are less crisp than traditional Italian biscotti, which typically only contain the fat from eggs. Prepared in one bowl, this recipe is simple enough to whip up on a weeknight. Preheat oven to 325 degrees and line a baking sheet with parchment paper. In a large bowl, mix together butter, peanut butter, and sugar until light and fluffy, around 1 minute. Stir in eggs until smooth, around 2 minutes. Add vanilla, baking powder, and salt. Mix in flour until just incorporated. Stir in chocolate chips or chunks. Divide dough in half. Directly on the baking sheet or on a lightly floured surface, shape each half into a rectangle roughly 10 inches long and 3 inches wide. Place the rectangles parallel to each other on the baking sheet a few inches apart. Bake for 25-30 minutes, until dough is firm to the touch. Let cool for around 5 minutes. Cut into equal-sized slices, around 1 inch wide. Place biscotti cut-side down. Bake for another 15 minutes, until edges are golden brown and crisp. Let cool directly on the baking tray. Store leftover biscotti in an airtight container at room temperature.